Most hunters, nowadays, express little interest in squirrels. Yet I still recall my first, taken some 55 years ago when I was just a teen. I spent many a Saturday, as well as afternoons after school, roaming the woods or sitting patiently under the Vermont oaks. I was proud of the long shots. But, more than anything, I learned the value of patience when taking a hunting stand. First to appear would be the chipmunks, hiding for three or four minutes before chattering incessantly. Then the red squirrels would begin moving. So long as I remained still, they’d go about their business, too. Finally, a grey would make an appearance, and the temptation would be to take the first shot. But I knew if I held a few more minutes, a couple of greys might move about. Because there were grouse in the woods, I packed a 20-gauge auto. But most of the squirrels, and the sitting bunnies, were taken with a handgun. I had no mentor for hunting, but my father was a top handgun shooter, and I started shooting a handgun when I wasn’t yet big enough to shoulder a .22 rifle. Whether it was paper bull’s eyes in our basement range or tin cans outside, from age six on, I enjoyed plenty of shooting and developed a fondness for the short guns that lingers to this day. Then, one Christmas morning, a Savage Model 24 appeared under the tree. I was initially taken with the combination of a .22 Long Rifle and .410 shotgun. But even at age 15, I soon recognized the limitations of the .410 for hunting and reverted to mostly carrying the 20 gauge and .22 revolver. Even a 3-inch .410 can be a handicap in the squirrel woods, as the game is often seen in open hardwoods at considerably farther distances than the .410 can handle. Yes, the .410 may serve to introduce a youngster to shotgunning, but consider that most youngsters need shoot only a box or two of .410s with a properly fitting gun before they become comfortable with the mild recoil, after which they are ready for a new lightweight single-shot, one in 20 gauge. I suggest trying a 20 gauge before handicapping any youngster unnecessarily with the .410. Quite often, it is the blast of the bigger shotgun that puts off a young shooter. Try having the youngster wear both ear plugs and muffs when shooting at the range. 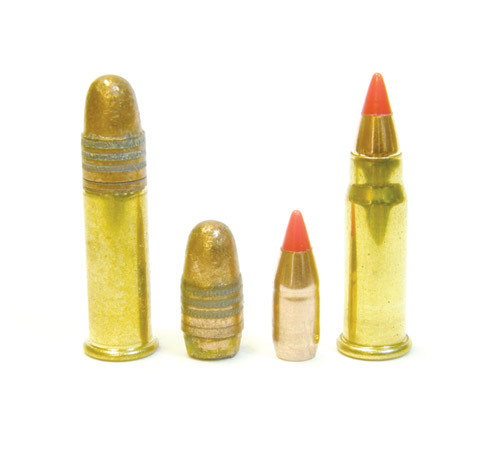 A 20 gauge can be as short-stocked and light as a .410, and there are some light 20-gauge factory loads with little recoil. It certainly is easy to handload reduced shotshells that duplicate .410 recoil in a 20 gauge. Increase the shotshell potency as recoil becomes less of an issue. H&R’s inexpensive Pardner and Topper single-shots come in a variety of weights and stock lengths, and there’s even a 20 gauge with screw-in chokes. When Savage brought out their over and under in .22 and 20 gauge, I immediately traded in my .410 version, and the more potent combination has been my go-to gun through almost 40 years of roaming Southern Vermont woods. And, yes, I’ll admit to shooting a few squirrels with the shotgun barrel. Savage changed their Model 24 a few years after I made my purchase. The new version weighed 8 pounds. My older version weighs 6-1/2. If you can find the older, lighter Savage 24H-DL, I recommend you buy it. In recent years, I’ve become more interested in taking longer shots with highly accurate, scoped rifles. I’ve grown especially fond of the newer .17 rimfires, with their flat trajectories and superb accuracy. Meat may be destroyed if shots aren’t well placed, but the accuracy is such that head shots or low lung shots are almost always possible. It isn’t at all difficult to get 1-inch groups at 100 yards with a .17 Hornady Magnum Rimfire or a .17 Mach 2. With the .17 rounds, it’s a new ball game. Rather than sitting on a log and shooting offhand, be prepared to take a braced shot. I now sit behind a shooting rest or use the high Harris bipod. Notwithstanding my well-below-average eyesight, the Mach 2 is so accurate that with a high-magnification scope, I sometimes aim to hit the squirrel in the eye rather than just in the head. I like standard 1-inch hunting scopes on squirrel rifles, at least 9 power and most often a 3-12X from one of my deer rifles. If you like to just leave your scopes on your guns, next time you buy a new scope for a deer rifle, consider moving the older glass to a .22 or .17 squirrel rifle. It will be more than adequate. The perennial problem with rimfire rifles has been the poor triggers. One noteworthy exception is Savage, which now puts its excellent AccuTrigger on all of its rifles, including the rimfires. With centerfire rifles, we may assume that autoloaders, lever actions and pumps will be less accurate than bolt actions. But that isn’t as true with rimfires. Yes, benchrest .22s are nicely heavy bolt actions, but competitions that require faster shooting than is convenient with a bolt action are often dominated by highly upgraded Ruger 10/22 autoloaders. Most of the modified Rugers have a highly accurate replacement barrel affixed securely to the action. With a little fine-tuning of the action to get a really sharp trigger, they shoot very tight groups despite the fact that only a spring holds the breech against the base of the cartridge. The best choke for shotgunning squirrels may be debated, but I like a double barrel with the option to use the Full or the Modified barrel, depending on whether the squirrel is scurrying through branches close overhead or running on the ground 40 yards away. No. 4 and No. 6 are the best pellet sizes for tough squirrel hides, and I speak from experience. I preferred 7-1/2 for grouse in the 20 gauge, but after opportunistic shots at squirrels with that same load, I’d too often need a finishing shot. The choice between 4 and 6 shot is a more interesting matter. Fours have tremendous punch even at long range, and most pellets exit the meat. But you need a truly Full choke to get the few pellets into a tight enough pattern for squirrels. No. 6 shot delivers more pellets and should put more squirrels in the pot. While most upland hunters use so-called low brass loads for grouse and rabbits, squirrel hunters most often choose full potency shotshells. Especially in 20 gauge. I don’t believe magnum loads provide tighter patterns, just larger patterns, turkey loads being the exception. If you can afford to shoot turkey shells at squirrels, that might be an interesting option for shotgunning in the tall timber. A year ago in this column (September 2008) I wrote of the just-right trajectory of a scoped .22 for hunting squirrels at 20 to 50 yards. The .17 Mach 2 provides a flatter overall trajectory with its lighter, faster, pointed bullet. Sierra’s Infinity Six ballistics program shows trajectories with various zeros, and one stands out as best. Zero the Mach 2 at 40 yards. The bullet is still climbing at 20 yards, but hitting just a half-inch low. At 30 yards, it is but a quarter-inch low, climbing to zero at 40 yards. At 50, it has climbed but an additional tenth of an inch, holding that out to about 65 yards, where it then drops back to zero at 70 yards. Hold just a little high for the closest shots, and then just center the cross hairs for the rest. Squirrels may be the perfect game for a young hunter. All of the elements are there: patience, marksmanship, preparation, plenty of success and the reward of fine table fare. Well before a youngster is ready for big game, he can likely manage a youth-sized .22 or 20 gauge, patiently sitting alongside a mentoring adult. My father died of cancer when I was 15. While he was ill, my mother would drive me to a woods about 10 minutes from home, where I’d spend the day hunting small game. I quickly learned the ways of the grey squirrel, and, to this day, a squirrel falling from a limb pleases me almost the same as a deer falling to the ground.